The Caspian Sea as seen from the International Space Station in 2015. A new study finds water levels in the Caspian Sea dropped nearly 7 centimeters (3 inches) per year from 1996 to 2015. 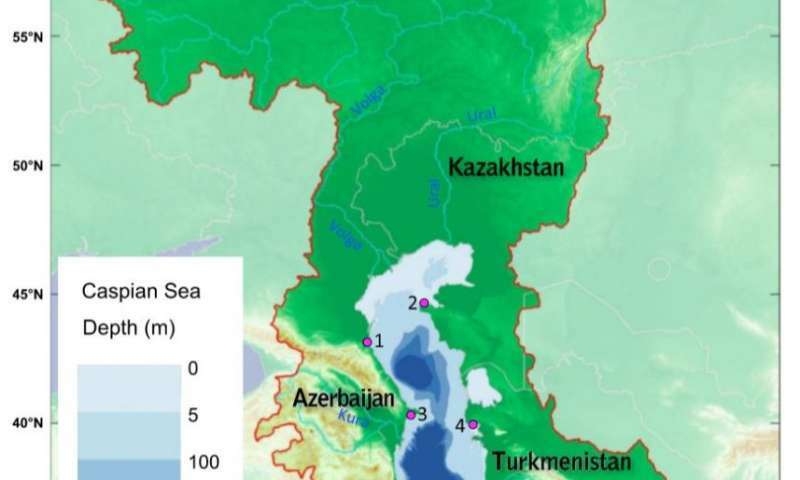 The current Caspian Sea level is only about 1 meter (3 feet) above the historic low level it reached in the late 1970s. Credit: Scott Kelly/NASA-JSC. Increased evaporation over the Caspian Sea has been linked to increased surface air temperatures. According to the data from the study, the average yearly surface temperature over the Caspian Sea rose by about 1 degree Celsius (1.8 degrees Fahrenheit) between the two timeframes studied, 1979-1995 and 1996-2015. These rising temperatures are likely a result of climate change, according to the study's authors. Evaporation brought about by warming temperatures appears to be the primary cause of the current drop in sea level and the decline will likely continue as the planet warms, according to the study's authors. "From our point of view as geoscientists, it's an interesting place because it's possible to construct a sort of budget for the total amount of water that's there," said Clark Wilson, a geophysicist with the Jackson School of Geosciences at the University of Texas at Austin, and co-author of the new study published in Geophysical Research Letters, a journal of the American Geophysical Union. "The real control that causes it to go up and down over long periods of time is really most likely the evaporation, which is almost completely dominated by temperature." 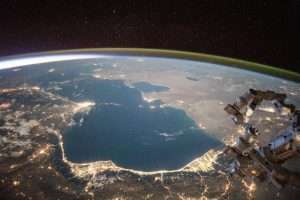 The new study began after Wilson and Jianli Chen, the study's lead author from the Center for Space Research at the University of Texas at Austin, along with other researchers, used the Caspian Sea to calibrate data from the twin satellites of the GRACE mission launched in 2002. By comparing measurements of the Caspian Sea from GRACE data and Earth-based measurements, the researchers helped improve the satellite data's accuracy. In doing so, they noticed the Caspian Sea's water levels were undergoing significant changes. "Once we got through with [the calibration], Jianli Chen said, 'Well, you know, this is very curious. Why is this changing so much?'" Wilson said. "That got us going on the current question, which is trying to understand what the reason is for these multimeter variations in the sea level. It's an interesting place, and it's been studied for a long time, but it wasn't really clear." The new study provides the first convincing evidence that increased evaporation over the Caspian Sea is a more important driving force of Caspian sea level change than river discharge or precipitation, said Anny Cazenave, a CNES space geodesist at the Laboratoire d'Etudes en Géophysique et Océanographie Spatiales (LEGOS) at Observatoire Midi-Pyrénées in Toulouse, France, who was not involved in the new study. "An interesting finding from the study is that over the last two decades, climate-model predicted water loss ... apparently cannot be balanced by water gain from discharge, and increased evaporation is a major factor leading to this imbalance," Cazenave said. "If the temperature in the Caspian Sea region continues to increase, the evaporation rate is also expected to increase. Unless river discharge increases accordingly or precipitation in the Caspian drainage basin increases accordingly, the imbalance is likely to continue." The Caspian reached a historic low of 29 meters (95 feet) below mean sea level in the late 1970s before water levels increased in 1978. If current evaporation rates continue, the results suggest the sea could approach the historic low again, according to the study's authors. The Caspian Sea supports many unique and ancient species remaining from when the sea was a part of the Tethys Ocean during the Mesozoic era, approximately 300 million years ago. Although most of these species live in the southern and middle regions of the Caspian, some use the shallow northern area as spawning grounds, including 90 percent of the world's sturgeons. Dropping sea levels would also impact the Kara-Bogaz-Gol Bay on the eastern side of the sea, which is less than 5 meters (16 feet) deep and contains one of the world's largest natural deposit of sea salts, according to the study's authors. "If you're going to take this to the next step, it would be to take a suite of climate models or look at some sort of ensemble predictions of future temperatures to get some idea of what those scenarios might be for the Caspian Sea," Wilson said. "You can imagine if you had a continued decline in sea level that led to several meters of loss, you've considerably diminished the size of the sea." Well, that would be pretty much the end of caviar. Another victim of global warming. Wait, wait, wait, I got it. What's with the sturgeon bias. Other fish lay eggs too, you know.